Hello, and welcome to my literary blog. The Powers of Words was created by a book lover who would like to share her hobby with other readers worldwide. You will find book reviews, film adaptations reviews and various other posts, all related to reading in general. After this introductory post, you will find my most recent publications. If you want to browse my blog in a more organised way, use the links at the very top of the page, where you'll finde archives and other useful information, or the labels on the right hand side menu. As you may have noticed, my blog is "bilingual", that is, I write in English and in French. However, my posts are not translated, unless I have read the book in both languages. I normally review in the language I read in but if you'd like a translation, just ask me and I'll be happy to do it. Some posts are only written in French, others in English, depending on the target audience. I hope it is not too confusing, but I haven't found a better way of doing it so far. Feel free to visit and leave comments. I enjoy having other people's opinions in order to improve my work, but remember to be polite. I will always reply to your comments. I am also interested in group reads or in comparing my opinion about a book with someone else's. If you have a blog, I'll be happy to visit if you leave me a link. I am in no way a professional reviewer. I review books that I buy, borrow or receive from publishers (when it is the case, it is always stated in the post). If you're interested in a review, please take a look at the "partners" page. My reviews are my own opinions, and yours might be different. I will always be respectful of a book and when I did not enjoy it, I always try to give my reasons. Bonjour, et bienvenue sur mon blog littéraire. The Powers of Words a été créé par une amoureuse des livres qui aimerait partager sa passion avec d'autres lecteurs du monde entier. Vous y trouverez des critiques de livres, des critiques d'adaptations cinématographiques et d'autres articles, tous en rapport avec la lecture en général. Après cet article d'introduction, vous trouverez mes publications les plus récentes. Si vous souhaitez visiter mon blog de manière plus organisée, utilisez les liens situés tout en haut de la page, où vous trouverez les articles et d'autres informations utiles, ou les catégories répértoriées dans le menu de droite. Comme vous l'avez peut-être remarqué, mon blog est "bilingue", c'est à dire que j'écris en anglais et en français. Cependant, je ne traduis pas mes articles, sauf si j'ai lu un livre dans les deux langues. Je rédige normalement ma critique dans la langue dans laquelle j'ai lu le livre. Toutefois, si vous désirez une traduction, il suffit de me le demander et je serai heureuse de la faire. Certains articles sont écrits en français uniquement, d'autres en anglais, selon le public cible. J'espère que cela ne vous embrouillera pas trop, mais je n'ai pas encore trouvé de meilleure solution. Sentez-vous libres de visiter mon blog et de laisser des commentaires. J'aime avoir l'avis d'autres personnes pour améliorer mon travail, mais rappelez-vous les règles de politesse. Je répond toujours aux commentaires. Je suis aussi intéressée par des lectures communes ou par la confrontation de mon avis sur un livre avec celui de quelqu'un d'autre. Si vous avez vous aussi un blog, je serai enchantée de le visitez. Laissez-moi juste le lien. Je ne suis pas une chroniqueuse professionnelle. Je critique des livres que j'achète, que j'emprunte ou que je reçois de maisons d'édition (dans ce cas, c'est toujours précisé dans l'article). Si vous êtes intéressé à avoir une critique, jetez un coup d’œil à la page "partenaires". Mes critiques reprennent mon avis personnel et le vôtre peut être différent. J'essaie toujours de montrer du respect pour un livre et quand je n'ai pas apprécié une lecture, je donne toujours mes raisons. Follow the link to vote for my blog on the A&M topsite. Thanks! 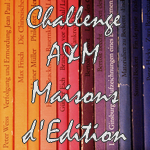 Suivez le lien pour voter pour mon blog sur le Topsite A&M. Merci ! 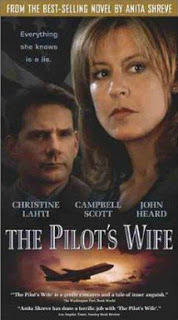 The Pilot’s wife is a drama film directed by Robert Markowitz and starring Christine Lahti, Campbell Scott and Alison Cambell . It was released in 2002 and is based on the book of the same name by Anita Shreve. Kathryn’s world collapses when she is woken up in the middle of a night by an airline official who tells her that her pilot husband has died in a plane crash. However, the worst is still to come; as the police assume he has committed suicide and killed all of the passengers on board, she decides to conduct her own investigation in order to find the truth... A truth she could never have imagined! Crhistine Lahti’s performance as Kathryn Lyons is outstanding. From deep sorrow to strong resolution, we follow her steps towards an uncertain future and grim discovery. There is no real need for words; her body language alone shows her emotions as she tries to discover the truth. Her relationship to her daughter Mattie (Alison Campbell) is only briefly illustrated, but gives the spectators food for thought. The chronology is one of the main strength of the film. Frequent flashbacks are mixed to the present plot, adding suspense and energy to the story. These memories of the past last a few seconds to several minutes – according to how important for our understanding they are – and give us a fragmented portrait of Jake. The contrast between the characters’ memories and the reality is clear and each of Kathryn’s discoveries about her husband’s secrets raises anew the same question: how well can you know a person? The Pilot’s wife’s filming style successfully goes with the action: from the music to the short scenes inserted in the chronology in order to help us understand the ending, every aspect works together so as to captivate the audience. The – wonderful – setting plays here an important role; we start the story in Kathryn’s cosy home, a safe and familiar environment. As the tension builds up, we go further and further: to her grandmother’s house, to London and then, finally, to Ireland. The resolution of the mystery is quite expected, as Kathryn has been assembling clues from the beginning. Still, a part of surprise remains as she discovers the truth about her husband’s death. This explanation is however quick and not necessarily easy to understand for spectators who lack knowledge of the context. It nonetheless remains a thrilling film in which we are submerged in family secrets and drama. Behind the mystery which stands at the forefront, subtle questions about love, family and relationships are raised... So, do you think you really know the people you share your life with? Director Robert Markowitz produced a film whose plot is extremely true to the novel it is based on. For those who have read the book, there are thus no real surprises. However, the general impression of the film is quite different from the one created by the reading. First of all, as is the case in most adaptations, there are fewer details. While Anita Shreve focuses mostly on the relationships between the different characters – Kathryn with her daughter, with Jake, with Robert, with her grandmother – the storyline of the film is only told through Kathryn’s perspective. There are, of course, several scenes in which she interacts with other people, but they lack the depth of a real relationship. On the other hand, the action seems much quicker and livelier. It is then the mystery which is at the forefront rather than the characters’ psychology. This change of focus causes a few other variations, mostly in the chronology of the plot. We do not get a full description of Kathryn’s feelings and of her coping with Jake’s death and secrets. We just share the experience with her and see everything through her eyes, while the other characters – Robert, Mattie and Julia – remain in the background. The flashbacks about the past are present, but not as relevant as in the original story. Therefore, the whole past-present rhythm changes, because these brief memories give the plot some dynamic. An important difference is the end, which remains completely open. It actually follows the same process as the rest of the plot: the spectators are told just enough in order to understand, the rest is left to their own imagination. Many questions are not answered, many details remain unclear, but I found this end somehow more convincing than that of the novel... Maybe because it is much more realistic! From a mostly psychological novel, Robert Markowitz made an enthralling mystery, which probably was a wise choice given the change of medium used to share the story. Although the plot remains unchanged, thus with less details, we obtain a completely different image of the characters, an image which is much more open to interpretation than in the novel. In my opinion, a very successful adaptation! Aus Mangel an Beweisen. Selbst in ihrem wildromantischen Haus am Meer geht Helen der Satz nicht aus dem Kopf. Aus Mangel an Beweisen wurde ihr Freund Paul am Mordfall an der jungen Frau freigesprochen. Seine Geliebte solll sie gewesen sein. Aber Helen vertraut Paul, jetzt möchte sie nur noch die Schrecken des letzten Jahres hinter sich lassen. In Saint-Muriel, in ihrem einsamen Haus an der bretonischen Küste. Merkwürdig ist nur, dass niemand im Ort Pauls Tante zu kennen scheint, von der er das Haus geerbt haben will. Und ist es wirklich Zufall, dass in das einzige Nachbarhaus Pauls alter Schulfreund, der "Richter" einzieht? Die beiden haben noch eine alte Rechnung offen, in der die junge Tote eine nicht unerhebliche Rolle spielt. Niemandem ist zu trauen in Susanne Mischkes schaurigem Kriminalroman, am allerwenigsten der abgründigen Helen, die ihren Paul abgöttisch zu lieben scheint. Ein isoliertes Haus an der bretonischen Küste. Ein Dorf, in dem man die Fremden nicht mag. Ein Mann, der aus Mangel an Beweisen in einem Mordfall freigelassen wurde. Seine Frau, die das Geheimnis dieses fremden Ortes nicht kennt. Der Nachbar, der ihnen mit einem Fernglas beobachtet... Mit dieser seltsamen Stimmung beginnt Das dunkle Haus am Meer. Das Buch ist ohne Zweifel ein Kriminalroman, aber eher ein psychologischer Krimi als ein typischer Thriller. Es gibt zwar ein paar spannende Szenen, aber der Leser empfindet vor alle Verwirrung; was für Geheimnisse behaltet dieses Ehepaar? Hatte Paul wirklich mit dem Tod nichts zu tun? Warum scheint es, als ob er und Helen sich von der Welt verstecken und ihr altes Leben vergessen wollen? Und wer ist der Nachbar, der ihnen zu kennen scheint? Der Leser reist zwischen Frankreich und Deutschland und lernt mehrere Figuren zu kennen. Am Anfang gibt es vier verschiedene Geschichte die am ersten Blick nichts miteinander zu tun haben. Als die Handlung sich aber entwickelt versteht man immer mehr subtile Zusammenhänge. Susan Mischke hat uns mehrere Überraschungen vorbereitet sowie einen spannenden Höhepunkt und eine gut Auflösung. Der Anfang ist jedoch ziemlich lang; wir folgen vor allem Helen in ihrem einsamen Haus, deren Alltag nicht so spannend ist. Die Figuren sind aber wirklich gut entwickelt und jede hat ihre eigene Persönlichkeit. Helen, bei der wir immer eine Art Verwirrung empfindet, ist natürlich die interessanteste. Bis zum Ende stellen wir uns Fragen über ihre Tate und Motivationen, was die Spannung garantiert. Wir erfahren auch ziemlich viele Details über Paul, die Schottin, Beatrix, Monsieur Wolf und ein paar andere Personen, was an die, was uns ermöglicht, die Fäden endlich Zusammenzuziehen. Das dunkle Haus am Meer war angenehm zu lesen, aber ich habe oft die Handlung zu langsam gefunden und ziemlich verwirrend. Diese Verwirrung kommt vor allem von Helen, die einen sehr besonderen Charakter hat und von den verschiedenen Szenen, die an unterschiedlichen Ort stattfinden. Die lineare Zeit hilft aber der Leser, sich zurechtzufinden und die Geschichte ist im Allgemeinen spannend und gut erzählt. Une aventure haletant avec une tension dramatique permanente, où une série de rebondissements mêle complots, trahisons et organisations secrètes. Autant d'obstacles que devra affronter Shina qui, très vite, se révèlera... Unique. Que se passerait-il si une guerre entre les humains venait à causer des dommages irréversibles à la Terre, n’y laissant que deux continents émergés ? Si une arme extrêmement puissante avait entraîné des mutations génétiques chez certains survivants, donnant ainsi naissance à des créatures hybrides mi-homme, mi animal ? Voici l’idée de base de Zoanthropes, la Métamorphose, premier roman de Mathias Rouage. Et il faut dire que le début de cette saga est une vraie réussite : une combinaison d’action, de réflexions sur des thèmes actuels et de descriptions d’un monde futuriste qui ressemble finalement étrangement au nôtre... Un mélange parfaitement dosé qui nous entraîne à toute allure au cœur de l’univers zoanthropique de la première à la dernière page. Impossible de s’arrêter. L’histoire commence sur le continent peuplé par les humains, qui vivent dans la peur constante des Zoanthropes, ces êtres considérés comme extrêmement dangereux, qui peuvent se transformer en animal. Bien qu’ils soient censés vivre de l’autre côté du monde, nombreux sont ceux qui se cachent parmi les humains, et même la présence des intervenators ne suffit pas à faire régner un climat de sécurité. Pour cette raison, tous les jeunes doivent se soumettre à un examen d’entrée de l’université, qui détermine si leurs gènes ont muté. Si le test est positif, ils doivent s’enfuir et échapper à la traque des humains pour retrouver le technobus qui les emmènera sur le continent Zoanthrope. Personne n’est à l’abri d’une mutation, et c’est donc avec beaucoup d’appréhension que l’héroïne, Shina Sirkis, se rend à l’examen. Sa mère biologique ayant été elle-même Zoanthrope, elle sait qu’il y a un risque qu’elle se retrouve obligée de fuir, mais même si elle parvenait alors en territoire Zoanthrope, il n’y aurait aucune certitude qu’elle survive face à cette race dangereuse. L’opposition entre deux continents est extrêmement bien mise en scène. Bien que semblables sur plusieurs points, on se rend vite compte de plusieurs différences fondamentales. Et quelle version de l’histoire faut-il croire ? L’héroïne et ses nouveaux compagnons d’aventure comprendront bien vite que la vérité n’est peut-être pas celle qu’ils pensent connaître. Mais distinguer les personnes en qui ils peuvent avoir confiance et celles qui tentent de les tromper pour leurs propres intérêts n’est pas aussi facile qu’il y paraît. Contrairement à de nombreux romans de ce genre, l’auteur ne bascule pas dans le cliché noir-blanc : les personnages sont décrits dans toutes les nuances de gris, ce qui garantit une action palpitante du début à la fin. Dans un roman de science-fiction jeunesse, il est clair que l’action joue un rôle central dans l’intrigue, et Zoanthropes relève le défi avec succès : dès le premier chapitre, nous voilà plongés dans les mystères ; les interrogations surgissent au fil des événements, nous laissant à peine le temps de respirer avant que les prochaines péripéties ne surviennent. Malgré un rythme soutenu, l’action est toutefois facile à suivre grâce à une organisation sans faille et une plume à la fois simple et élégante. La grande force de ce roman ne réside toutefois pas seulement dans l’action. En effet, le fait de confronter l’image qu’ont les humains des zoanthropes et inversement invite à la réflexion. De l’identité à la propagande, en passant par l’organisation hiérarchique d’une société, il n’est pas difficile de transposer la situation de ce monde du futur dans la société contemporaine. De manière naturelle, des thèmes profonds sont abordés, mais c’est au lecteur que revient la responsabilité de se faire sa propre idée. Des personnages attachants et bien développés, un monde futuriste mais réaliste, deux races ayant chacune leur version de l’histoire, une action palpitante et pleine de suspense, des réflexions profondes sur des thèmes actuels... Tous les ingrédients sont réunis pour le premier tome d’une série à succès ! 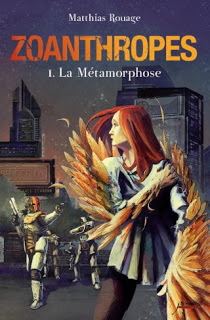 Matthias Rouage nous livre donc un magnifique premier roman en vente dès le 10 mai. Je remercie du fond du cœur les éditions Scrineo pour leur confiance et le forum A&M pour l’organisation de ce tour, sans qui je n’aurais sans doute jamais découvert cette perle de la science-fiction jeunesse. Bien évidemment, merci également à l’auteur, qui a su me faire voyager dans un monde peuplé de créatures étranges, et qui pourtant se rapproche bien du nôtre. Après un tel coup de cœur, je compte bien poursuivre sur ma lancée avec la lecture de romans de science fiction et c’est avec beaucoup d’impatience que j’attends le second tome ! (Résumé du site de l'éditeur) Après de longues années de guerre et un cataclysme, le monde occidental est détruit. A 17 ans, Conan est un rescapé qui vit sur un îlot depuis cinq ans lorsque l’arrivée d’un bateau arborant le pavillon ennemi vient rompre sa solitude. Emmené contre son gré, Conan découvre la ville de l’Ordre nouveau, Industria, dans laquelle sa force physique et son intelligence le destinent à la condition d’ouvrier. Cependant, Conan refuse de se soumettre à la hiérarchie sociale d’une cité dont il exècre le fonctionnement totalitaire. Mû par son esprit d’indépendance et son désir de retrouver les siens à High Harbor, une petite cité qui résiste tant bien que mal à la suprématie de l’Ordre nouveau, il trouve l’aide nécessaire pour planifier sa fuite. Imaginez que, dans un monde prédominé par la guerre, une catastrophe naturelle cause des dommages irréversibles pour l’être humain. Imaginez qu’une énorme vague recouvre la plupart de la planète, engloutissant des villes entières et leur population. Imaginez que les survivants se retrouvent privés des inventions scientifiques qui ont révolutionné le monde et que leur mode de vie devienne proche de celui des hommes primitifs. Qu’adviendrait-il alors de l’humanité ? 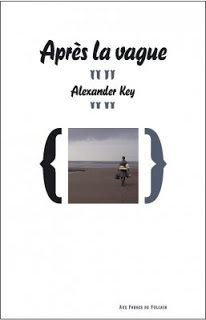 Voici le point de départ du roman d’Alexander Key, Après la vague. Suite au « Changement », la mer a recouvert la planète, ne laissant que peu de terres émergées. Le jeune Conan vit sur un îlot, avec pour seule compagnie, des oiseaux, et il doit se battre jour après jour pour survivre. Lorsqu’il est secouru, ce qui devrait être une délivrance se révèle pourtant pire encore que ce qu’il avait vécu jusque là : emmené à Industria, la ville régie par l’Ordre Nouveau, il découvre un système révoltant auquel il refuse de se soumettre. Heureusement, Conan n’est pas aussi seul qu’il le croit et un vieil ami l’aidera à accomplir sa mission. Le résumé proposé sur le site de l’éditeur m’a immédiatement fait penser à La planète des singes, de Pierre Boulle, qui m’avait beaucoup plu à l’époque. Malgré mon manque d’expérience de romans post-apocalyptiques et de science fiction, je me suis laissé entraîner dès les premières pages dans ce monde d’après le Changement. Une écriture agréable nous entraîne aux côtés de Conan dans ce monde hostile et le roman est parfaitement rythmé par l’action. C’est au fil des évènements que nous en apprendrons plus sur les personnages et les évènements qui ont changé le monde. Comme tout livre de ce genre, nous assistons à la dénonciation du comportement irresponsable de l’être humain ; le Changement est une conséquence de leurs guerres, de leurs luttes pour le pouvoir et d’un grand manque d’attention portée à la planète. Nous ne savons que très peu de choses sur le monde avant cette grande catastrophe, mais il n’est pas difficile d’imaginer qu’il s’agissait de la Terre que nous connaissons. S’opposent par la suite deux villes dans lesquelles les hommes ont réagi tout à fait différemment : Industria et High Harbor. Industria est en quelque sorte le pire qui peut arriver, une ville parfaitement artificielle, où le système favorise les gens ayant du pouvoir par rapport aux citoyens de deuxième et troisième classe. Les marqués, quant à eux, n’ont aucune chance. Un climat d’oppression règne dans cette zone, là où tout le monde est prêt à dénoncer les autres pour accéder aux richesses qui sont réservées aux dirigeants. Toutefois, même si ce lieu représente une sorte d’enfer, les personnages ne sont pas tous « mauvais » ou « bons ». Si principaux membres de l’Ordre Nouveaux ont clairement de mauvaises intentions, et Conan et les siens, de nobles intentions, les autres protagonistes sont bien plus nuancés. Comme l’explique le Professeur, comment ne pas admirer ceux qui ont survécu au Changement et se sont adapté à ce nouveau mode de vie. À High Harbor, bien que la situation soit différente, il y a également des problèmes et l’on remarquera bien vite qu’on est loin du paradis. Ici, tout est naturel et nombre d’hommes sont redevenus des « sauvages ». Or, des luttes pour le pouvoir se préparent également, conséquence inévitable du manque de ressources et de l’impuissance des habitants face aux forces de la nature. Lequel de ces deux endroits est donc préférable ? L’auteur ne nous le dit pas, et tout lecteur comprendra sans doute qu’un compromis entre nature et science pourrait être une option. Le contraste entre Conan, jeune inexpérimenté, et le Professeur, le grand savant connaissant le secret qui pourrait les sauver, est très intéressant. Tous deux se battent pour la même chose, mais le jeune homme a encore beaucoup à apprendre ; de même, le Professeur ne peut mener à bien sa mission tout seul. Alexander Key nous propose ici une solution pour survire à des situations qui paraissent insurmontables : l’entraide. De nombreux survivants souhaitent reconstruire un monde meilleur qu’auparavant, mais face aux difficultés, ils doutent et désespèrent. Et, pendant ce temps, d’autres en profitent pour assouvir leur soif de pouvoir. Les protagonistes sont hauts en couleur et bien développés. Il est facile de s’attacher à Conan au fil des pages, ainsi qu’aux siens, qu’il s’agisse du Professeur, de Lanna, son amie d’enfance, du docteur Shann ou des autres survivants. Comment ne pas admirer leur courage ? Quant aux personnages secondaires, bien qu’ils ne soient qu’esquissés, ils nous donnent matière à réfléchir tant ils suscitent des émotions contradictoires. La science et le surnaturel se côtoient sans cesse, mélange qui ajoute encore de l’intérêt à l’intrigue. Les inventions technologiques sont aussi importantes que la voix qui guide nos héros. Par ailleurs, dans un monde où les moyens de communication modernes ont disparu, la télépathie prend une dimension très importante et resserre les liens entre différents personnages. La fin du roman est très ouverte, ce que j’ai apprécié, car c’est au lecteur d’imaginer la suite. Et, au vu des derniers évènements qui surviennent, Après la vague est finalement bien plus qu’un simple avertissement ou une critique de la société ; c’est avant tout un message d’espoir qui nous est livré par des mots simples et un style élégant. Et si un mélange de science et de foi, d’amitié et d’entraide, était la solution aux problèmes de l’humanité. Une traduction de qualité pour un roman magnifique. Je remercie du fond du cœur les éditions Aux Forges de Vulcain de leur confiance et le forum A&M pour l’organisation de ce partenariat. Ce fut un véritable coup de cœur que je recommande à tous, petits et grands !